Visit the tower photo gallery folders to see the restoration work that was done to the tower! For the summer season the Higginson Tower is usually open starting in early May, from 10 a.m. to 5 p.m., Wednesday through Sunday. Tour groups are welcome! Enjoy bilingual interpretive program, displays of artifacts found during an archaeological investigation which took place prior to restoration. Listen to history as you climb the steps inside the tower to the top! Have a picnic on site, or visit nearby Arbor Gallery just a few steps away, located inside the original home of William Higginson, the son of Thomas Higginson, who built the stone portion of tower. 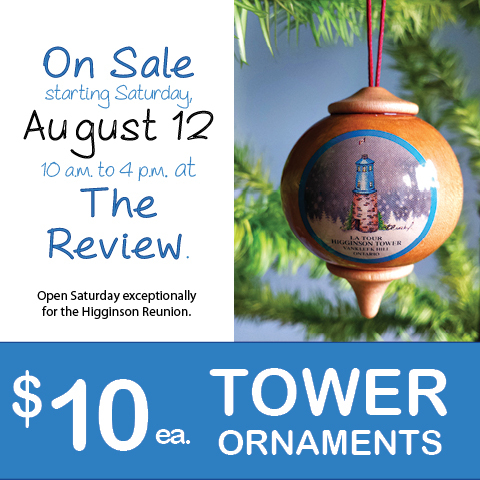 The Higginson Tower is located close to St. John the Apostle Anglican Church (the church on the hill along Highway 34 as you enter Vankleek Hill from the north end). The ruins were owned by Phil Arber, who also owns the building that houses Arbor Gallery – CfCA, which was once the home of Lieutenant Thomas Higginson, who built the wind-powered grist mill in 1832. William Higginson, son of Thomas, added the upper portion to create a conservatory and also built the red brick house nearby, now home to Arbor Gallery – Centre for Contemporary Art. Phil Arber donated the ruins, and a portion of property around the ruins, to Champlain Township and the Higginson Tower Committee raised $108,000 to restore this historic structure to its former stature. In addition, the committee obtained $24,400 from the Ontario Trillium Foundation, $30,000 from the Prescott-Russell Community Development Corporation, $20,252 from the Ontario Ministry of Agriculture, Food and Rural Affairs (Rural Economic Development, or RED), a grant of $25,000 from a Champlain Township reserve fund and a further $9,900 from the Prescott-Russell Community Development Corporation for the tower interpretive program. More than $100,000 worth of in-kind services, including architectural design services, legal services, tree removal and reduced prices by many of the contractors made this project possible. Many community partners worked with the Higginson Tower Committee to make this project happen. A right-of-way is registered on the property crossing in front of St. John the Apostle Anglican Church, thanks to the cooperation and enthusiasm of the Vankleek Hill congregation. The Higginson Tower Committee also secured parking privileges courtesy of the owner of the Marché Éclair building (the old Fraser Cheese Factory building), from owner Yvon Lavoie. This committee was formed when Yves Berthiaume, owner of Berthiaume Funeral Home in Vankleek Hill and Hawkesbury, offered to donate a container and arranged for a concrete vault to be donated by Costello Vaults. Meeting with André Martel, Gary Barton, Phil Arber and Louise Sproule in 2003, it was decided to use the time capsule idea as a fund-raiser to restore the 175-year-old Higginson Observation Tower. Restoring the tower had originally been on a list of projects during Vankleek Hill’s Bicentennial/Centennial celebrations in 1997 and while some funds were raised at that time, the project had been dormant for some time. Shortly after its inaugural meeting, the committee asked Champlain Township if it would take ownership of the restored tower if the restoration funds and restoration project were undertaken by a volunteer committee which would raise funds and oversee the restoration. Here is the list of major community partners which worked with the committee by donating time and resources to the Higginson Tower Restoration project. Berthiaume Funeral Home, Vankleek Hill & Hawkesbury: Donation of container for time capsules and manufacture of individual time capsules for families, individuals and organizations. Martel & Sons, Vankleek Hill: Donation of labour/engraving for names on Cobblestone Walk, Corporate Plaque and Founding Families Plaque plus labour to excavate around base of tower to install drainage. The Review, Vankleek Hill: Donation of printing costs, promotion, photocopying and advertising associated with project Donation of minisite on www.vankleekhill.ca operational from 2006 to May 2011.
kWEBdesign.ca: Donation of web design services on the original website operational from 2006 to May 2011. With special thanks to: Anglican Parish of Vankleek Hill (Fenaghvale, St. John’s and East Hawkesbury) and the Anglican Diocese of Ottawa treasurer activities. Vankleek FM, Vankleek Hill: Community radio announcements and sound-clip preparation and editing for this website. Champlain Township councilors for their agreement to be our partners to ensure that the restored Higginson Tower is forever in the public domain. And to Champlain Township Clerk-Treasurer Robert Lefebvre and township staff for all their assistance and advice.